Somehow it’s wery hard to find clickable and dragable maker that can show lat and lang on the web so i decidet to create my own. 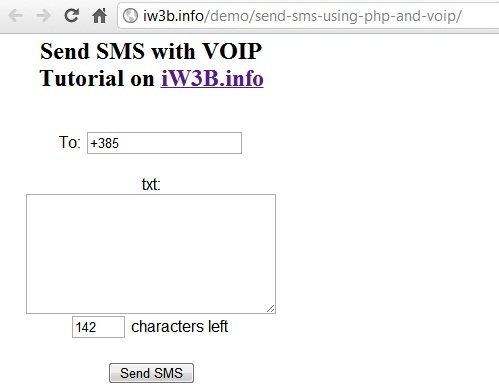 In this script and demo page you can see how simple is to get latitude and longitude from user when he click or drag a marker. Try click on map more times on different places and you will see that the first marker is deleted and new one created and the map is centered on marker. That makes this script so special. You can integrate this script so user can point on places they visited or they own etc. 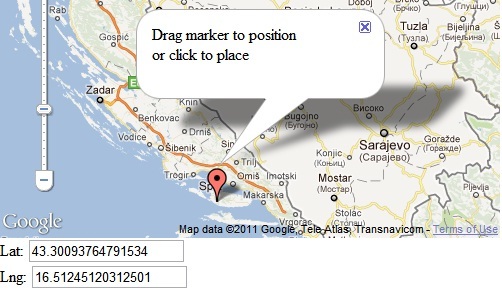 content: "Drag marker to position <br /> or click to place"
You can download script or see demo page below. If something stuck feel free to comment. Still working on the site. I’l notify you went it will be possible to subscribe. Hi there, just required you to know I he added your website to my Google bookmarks due to your layout. But seriously, I feel your world wide web internet site has 1 in the freshest theme I? ?ve came across. It extremely helps make studying your web site significantly easier. Thanks, I’m still working on the site. But only editing some small parts. Thank you for each of your work on this web page. Debby delights in working on investigation and it is easy to understand why. My partner and i learn all about the dynamic mode you offer good tips by means of your web blog and therefore welcome response from other individuals on this area of interest and my child is truly learning a whole lot. Take pleasure in the rest of the new year. You are always doing a fabulous job. Fell out of bed feeling down. This has birhgnteed my day! Thank you for sharing with us, I believe this site truly stands out : D.